For other uses, see Quonset (disambiguation). 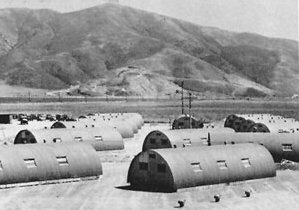 Quonset huts in front of Laguna Peak, Point Mugu, in 1946. A Quonset hut /ˈkwɒnsɪt/ is a lightweight prefabricated structure of corrugated galvanized steel having a semicircular cross-section. The design was developed in the United States, based on the Nissen hut introduced by the British during World War I. Hundreds of thousands were produced during World War II and military surplus was sold to the public. The name comes from the site of their first manufacture at Quonset Point at the Davisville Naval Construction Battalion Center in Davisville, Rhode Island. 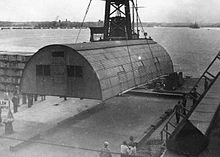 Quonset huts were manufactured by many independent contractors in countries around the world, but the first were manufactured in 1941 when the United States Navy needed an all-purpose, lightweight building that could be shipped anywhere and assembled without skilled labor. The George A. Fuller construction company manufactured them, and the first was produced within 60 days of signing the contract. The original design was a 16 feet (4.9 m) × 36 feet (11 m) structure framed with steel members with an 8 feet (2.4 m) radius. The most common design created a standard size of 20 feet (6.1 m) × 48 feet (15 m) with 16 feet (4.9 m)10 radius, allowing 960 square feet (89 m2) of usable floor space with optional 4 feet (1.2 m) overhangs at each end for protection of entrances from the weather. Other sizes were developed, including 20 feet (6.1 m) × 40 feet (12 m) and 40 feet (12 m) × 100 feet (30 m) warehouse models. The sides were corrugated steel sheets, and the two ends were covered with plywood which had doors and windows. The interior was insulated and had pressed wood lining and a wood floor. The building could be placed on concrete, on pilings, or directly on the ground with a wood floor. The original design used low-grade steel, which was later replaced by a more rust-resistant version. The flexible interior space was open, allowing use as barracks, latrines, medical and dental offices, isolation wards, housing, and bakeries. Between 150,000 and 170,000 Quonset huts were manufactured during World War II, and the military sold its surplus huts to the public after the war. Many remain standing throughout the United States as outbuildings, businesses, or even homes, and they are often seen at military museums and other places featuring World War II memorabilia. Many were also used around the United States for temporary postwar housing, such as Rodger Young Village in Los Angeles, California. Some are still in active use at the United States military bases. ^ "Benefits and Applications of the Quonset Hut Design". Alaska Structures. Retrieved 1 November 2017. Wikimedia Commons has media related to Quonset huts. Feature article on the design and origin of the Quonset Hut from the Varnum Continentals historical organization in East Greenwich, RI. History of Quonset Hut from the U.S. Naval History and Heritage Command website. Quonset Hut History in Washington State. Washington State Department of Archaeology & Historic Preservation.